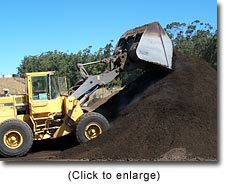 Sonoma Compost operates the Organic Recycling Program on behalf of the Sonoma County Waste Management Agency. We accept yard trimmings and vegetative food discards that are placed in curbside containers by local residents. Yard trimmings are also delivered directly to our site by landscapers, tree trimmers and the public. In addition, we accept selected agricultural byproducts from local farms, wineries and food processors. These materials are carefully made into premium quality organic compost and mulches, as well as bio-fuel that is used to generate electricity. Tree limbs are cut to the right length and split, seasoned and sold as affordable firewood. We also accept wood scraps provided it is unpainted and not pressure-treated. After re-useable lumber is sorted out, the balance is converted into our Path Mulch and bio-fuel. Our Waste Management Agency includes representatives from the County of Sonoma and its cities, and serves the interests of over 485,000 local residents. Their mission is to meet waste diversion goals established by the state of California. In addition to yard and wood scraps, the Agency deals with a number of waste issues, including household hazardous waste, public education, public event recycling, and long-term waste management planning. Since implementation in 1993, Sonoma Compost has successfully diverted approximately 1,460,000 tons of yard trimmings and wood waste from landfills. This represents approximately 18% of the County’s total waste generated in that time. With the help and support of local residents, we have extended the life of our local landfill and are reducing the amount of waste needing to be trucked to out of county to surrounding landfills. Because it’s much cheaper to recycle yard and wood debris locally, than to transport these materials to out of county landfills, local residents pay less to drop these materials off at the County’s Central Landfill. Similarly, trash hauler rates for organic materials are lower because haulers pay less to deliver curbside collected yard waste to Sonoma Compost’s facility than to haul it long distances to out of county landfills. One of the benefits of the organic recycling program is a great selection of affordable, organic compost and mulches, that will help improve soils in all parts of the County. Our tiered pricing structure provides generous discounts to those that purchase in larger quantities. Over the years, thousands of customers in Sonoma, Napa and Marin Counties have trusted Sonoma Compost to deliver knowledgeable advice and top quality soil products. 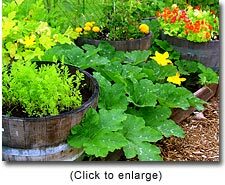 Our compost and water conserving, weed suppressing mulches are used by organic farmers, grape growers, landscapers and backyard gardeners. Public agencies use our compost and mulch in high profile projects such as school landscaping and vegetable gardens, athletic fields, parks and highway projects. Sonoma Compost is a small company. We believe in, and support, sustainable, organic gardening, farming and landscaping practices. Such practices protect our air and water, and replenish our valuable topsoil resource. Many who use our compost and mulch, find they can reduce or eliminate the use of chemical fertilizers, herbicides and pesticides.